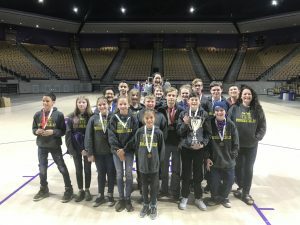 On March 30th the Waynesville Middle Science Olympiad team took second place at the regional competition hosted at Western Carolina University. These students from 6th, 7th, and 8th grade worked hard all year to prepare for this event. Of the 19 students on the team 6 have qualified to move on to the state competition in Raleigh at North Carolina State University on April 27th. The team included 6th graders: Luci Snyder-Lowe, Alyssa Maronne, Dustin Moore, Sarah Turner, Aimee Crawford, Bella Williamson, Hailey Stevenson, Skylar Ball. 7th graders: Kai Maggard, Bryant Oancea, Malyk Gibbs, Gabriel Markley, 8th Graders: Alyssa Messer, Kira Cahoon, Jayla Pamplin, Joseph Clontz, Bradley Weaver, Azy Henderson, Cameron Duvall. The six moving on to State are Bella Williamson, Dustin Moore, Kira Cahoon, Alyssa Messer, Azt Henderson, and Cameron Duval.